Here we go again in the battle of the diets. Another weight loss study was published this week. This one, partly funded by Atkins Research Foundation, pitted a low-fat diet against a Mediterranean diet against an Atkins-like diet. The news has either declared Atkins the winner, or that they all worked, or that they all failed. So, at the risk of boring regular readers with a rehash of diet study fallacies, here’s a quick rundown. This trial was conducted in 2005-2007 in Dimona, Israel. It was registered as a phase 1 trial (ClinicalTrials.gov registration #NCT00160108), explained here. Given its size and duration, though, it appears more a combined phase 1 and 2, designed to evaluate the safety and note the effects of the dietary interventions on weight loss. The objectives of this 2-year randomized trial were to evaluate not just the safety and weight loss effectiveness of the three diet plans, but also to test the effectiveness of a workplace weight loss program. · diet adherence was monitored by a 127-item food-frequency questionnaires completed by each participant electronically at work, at the start of the study and at 6, 12 and 24 months. 1. A low-fat diet based on American Heart Association guidelines; aimed at 1,500 kcal/day for women and 1,800 kcal/day for men; 30% calories from fat; 10% calories from saturated fat; and no more than 300 mg cholesterol/day. These participants were told to eat low-fat grains, vegetables, fruits and legumes; and limit additional fats, sweets and high-fat snacks. 2. A moderate-fat Mediterranean diet high in vegetables and low in red meat, with poultry and fish proteins. Calorie restrictions were the same, but fat was to be no more than 35% of calories, mostly from olive oil and 5-7 nuts/day. 3. A low-carbohydrate diet, described as 20 grams of carbohydrates/day during a 2-month induction phase and immediately after religious holidays, with a gradual increase to a maximum of 120 g per day to maintain weight loss. There were no limits on calories, protein or fat. These participants were told to choose vegetarian sources of fat and protein and avoid transfat. According to the researchers, at enrollment, all of the study participants had similar diets. During the study period, the low-fat and Mediterranean diet groups ate about 50% of calories from carbs and 19% from protein. The low-carb group reduced their carbs to 40% of their calories and increased protein to 21.8%. Total fats among the three groups were 30%, 33% and 39%, respectively; with saturated fats 9.6%, 9.6% and 12.3%. All of the groups increased their physical activity during the study, the Mediterranean dieters the least. Proponents of the various diets will argue endlessly about if these renditions correctly followed their versions of their diets, or if the results would have been better/worse if the fats or carbohydrates had been higher/lower or came from different sources. But, all of those should-a, could-a, would-a debates are nonissues when it comes to examining the findings themselves, as you’ll see. The 322 participants averaged 52 years of age with BMIs of 31. They were nearly all men — 89%, 89% and 99%, respectively. There were a few minor health differences between the groups, which had no importance to the relevant findings. The participants assigned to the low-carb group were slightly more likely to be diabetic and to be on oral glycemic-control medications. Those in the Mediterranean diet group were slightly more likely to have heart disease. During the trial, the authors said there was little change in the medications used for cholesterol, blood pressure or glycemic control among any of the diet groups. Nor were there any significant differences between the groups in waist circumferences or blood pressures throughout the study. In other words, they lost one to 1.5 ounces a week by dieting for 2 years, with a difference of less than 4 pounds between the various diets after 2 years. Clinically, this is insignificant. But that’s not the full story. The impression given in news reports is that the dieters steadily lost weight during the two-year study and the ‘Atkins’ dieters came out ahead of the pack. That’s not what really happened, of course, just as we’ve seen with all diet studies. Like a similar study on women dieters published last year, it would be more accurate to say that the low-carb dieters had the biggest initial weight loss and the more dramatic weight regain. In the beginning, all of the dieters lost weight for the first 5-6 months of this study. The low-carb dieters lost about 5 pounds more than the other dieters, but it had nothing to do with any special aspects in the diet’s composition. The low-carb group had been the most enthusiastic in reducing their calories compared to the other diet groups. Given this was not a blinded trial and was sponsored by the Atkins Foundation, perhaps this intervention group had inadvertently been given added attention or was trying hardest to please. We’ll never know. But they reduced their calories during the first six months by about 102-305 kcal per day more than the other diet groups. If we believe 3500 kcal = 1 pound, then they should have lost about 5-13 pounds more than the other diet groups. Thereafter, the dieters all began the predictable weight regains. But it wasn’t because they were cheating on their diets. As in all diet studies, their weight was coming back on, despite the dieters reducing their caloric intakes increasingly more and more. 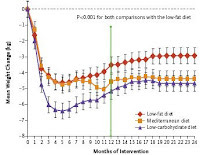 Compared to the first six months, during the second half of the first year, for example, the low-carb dieters cut an additional 30 kcal/day from their diets, the low-fat dieters had reduced their calories by about 100 kcal/day more, and the Mediterranean dieters by 67 kcal/day. The weight regain trajectories were the most dramatic among the dieters who’d reduced their calories most dramatically. Given we’re talking about a difference of 4 pounds by year two, we’re getting into splitting hairs-ville here. But, the point is that none of these diets worked to help people lose more or keep it off. Since the first low-calorie diet book was published nearly a century ago, diet doctors have come up with every imaginable gimmick for reducing calories, manipulating macronutrients in every conceivable way. If anything was truly effective, after nearly a century, there would be no diet industry and everyone would be slim. Any contrivance to cut calories works to enable most everyone to lose some weight... but only temporarily... and only to a point. Then, those homeostatic metabolic adjustments work to return body weights to their genetically-determined setpoint range, in both naturally obese and nonobese bodies. These biological adjustments are so powerful, as much as a four-fold increase in metabolic efficiency, that to keep weight off below one’s natural range, or to try to lose more, requires increasing severe caloric restrictions, not optimal for nutritional health or wellbeing. As one of the country’s foremost obesity researchers, Dr. Jeffrey M. Friedman, M.D., Ph.D., head of the Laboratory of Molecular Genetics at Rockefeller University, New York, and colleagues have shown, people can exert a level of control over their weights long-term within a 10- to perhaps, 15-pound range. Many people spend their lives losing and regaining the same dozen or two pounds, believing with each new diet that this one will be different. Naturally thinner people also believe that since they can lose 10-15 pounds fairly easily, that a fat person can just step and repeat that ten times, but it doesn’t work that way. A naturally fat person’s set point kicks in exactly like a thinner person’s, as seen in this study of “obese” men. Consistently, even with the most restrictive, rigidly-followed diets among the most motivated people, weight is lost for about 6 months and then regained. As the FTC’s expert panel and every expert review of the evidence has concluded, weight regain is the rule and virtually everyone regains all of their weight by 5 years. It is well acknowledged among obesity researchers that no dietary and exercise intervention has been shown to work long-term in virtually anyone and that for a diet study to credibly demonstrate effectiveness, it must follow people for at least five years. So, why do so many popular diet studies stop well before that? A final point bears note. Looking at the graph of the weight changes among the diet groups, it might appear that during the last year of the trial, the regain trajectories were beginning to flatten. Don’t mistake this for weight maintenance. It’s chartsmanship and statistics. The low-carb dieters who’d started out all gung-ho, lost their enthusiasm and became disenchanted as they continued to regain weight despite cutting their calories the most severely. After the one year weigh-in, increasing numbers began dropping out. By the 18 month and 24 month weigh-ins — one in five had dropped out, more than any other diet group — and only 78% of the low-carb diet group was left. This compared to 85.4% of the Mediterranean dieters. The low-fat dieters hung on the longest, but their attrition rate began escalating towards the last 6 months of the study. At the two-year mark, 91% were still enrolled. But the author’s analysis, as shown on the graph, included all of the dieters. How’d they do that if so many were no longer in the study? It’s a statistical technique where the last known weight is carried forward, as if maintained through the end of the trail. Given the dieters were all on an upward trajectory, these carried-forward weights flatten out the diet group’s weight regain and make the weight loss appear better maintained. You’ll see, looking at the graph, that the weights begin to flatten out after 12 months and most notably after 18 months. You’re seeing the effects of increasing numbers of carried forward weights. One popular squabble among various diet proponents is that their diets appear more effective if we look only at the weight changes among the participants who stayed on the diets for the entire two-year trial. The difference between the final weight lost among all of the participants and just those who stayed on their diets, though, was surprisingly nominal. How little? A whopping 0.2 kg to 0.8 kg — less than 2 pounds — after two years. While it would have made those charted weight regain trajectories appear more indubitable, it’s still a clinically meaningless amount. But, because this argument comes up frequently when people want us to buy something, it’s important to understand why no medical professional would fall for this. You wouldn’t want your doctor to recommend a risky treatment that didn’t work in 95% of the patients who were prescribed it, for instance, nor would a doctor make such a prescription. Ideally. When evaluating the effectiveness of a treatment, we look at all of the patients in a study who were prescribed the treatment. Researchers don’t get to ignore the patients in a trial who did poorly or were unable to tolerate the treatment. They don’t get to cherry pick and just report the good results. That’s also why high attrition rates in a study make its results less credible. It’s health outcomes that matter. This phase 1 study wasn’t designed to evaluate any medical reason for going on their diets.